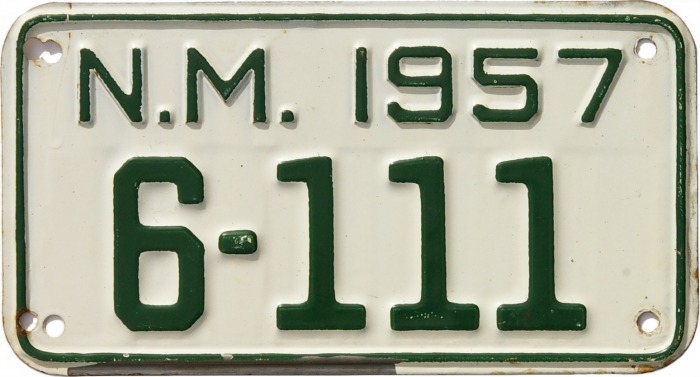 Boat plates are known to exist for the years 1955, 1956, 1957, 1958 and 1959 in a format identical in size to, and similar in format to, motorcycle plates of the same era. The principal difference is that rather than the letter “M” prefix used by bike plates, the boat tags had a prefix consisting of a single numerical digit. That digit told the maximum number of passengers that the boat was rated to carry. A prefix of “0” was used for boat houses, which were also required to be licensed. Rather than being issued by the DMV, these plates were obtained from the New Mexico State Park Commission and the use of them was required only at Conchas Dam Lake. Within New Mexico are several lakes created by dams built by the U.S. Bureau of Reclamation. On at least two of them—Elephant Butte Lake and Caballo Lake—the Bureau of Reclamation required the use of boat license plates which were issued by that agency. 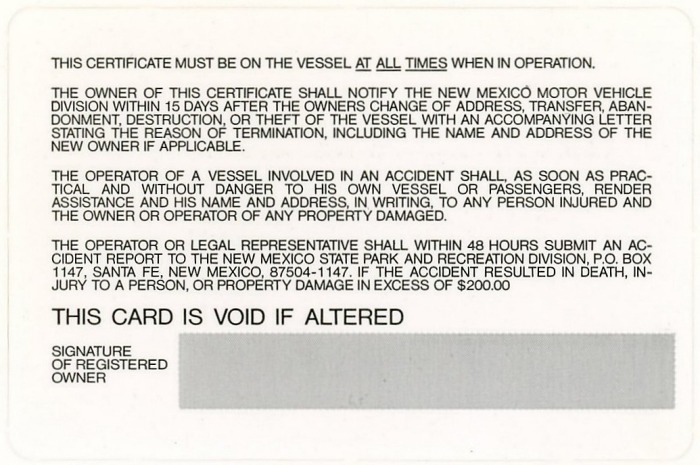 In contrast to the New Mexico boat plates illustrated above which were issued as singles, the BuRec tags were in some, if not all, years issued as pairs, with 1954 being a confirmed example. See also Civilian Conservation Corps and U.S. Government for other types of license plates issued by the federal government within New Mexico. 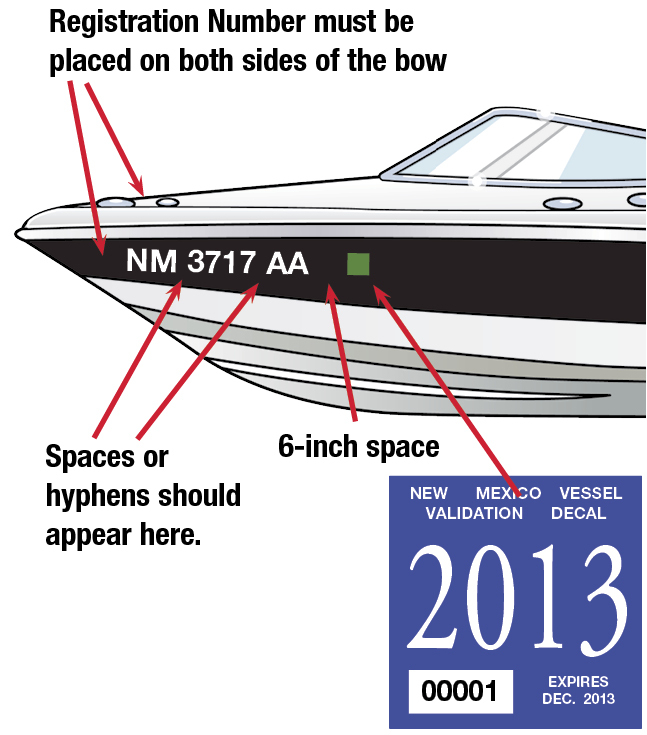 These requirements remain essentially the same today, but with the addition of a 3" x 3" “Vessel Validation Decal” which shows the expiration date of the boat’s current registration. Licensing and registration nowadays are handled by the Motor Vehicle Division, but monitoring and enforcement are still conducted by the New Mexico Parks Department. Illustration from The Handbook of New Mexico Boating Laws and State Park Regulations, New Mexico State Parks Division.